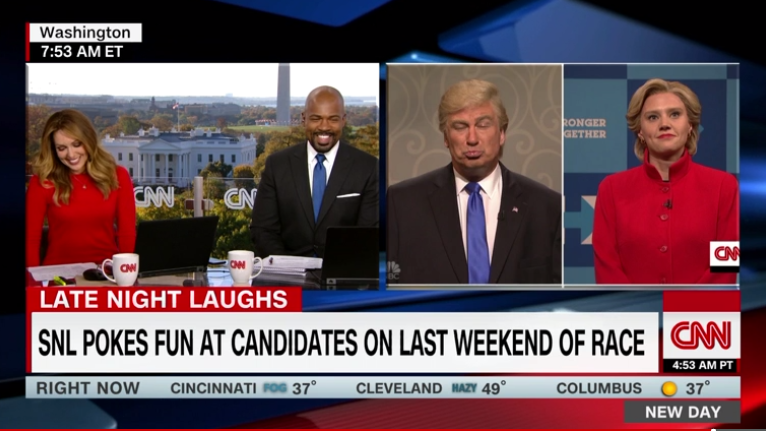 The CNN correspondents this morning were dressed uncannily like SNL’s Alec Baldwin and Kate McKinnon, who were dressed uncannily like Donald Trump and Hillary Clinton. Although both reporters denied accusations of foresight and planning, they did so by citing the unreasonableness of watching the previous night’s live show at one or two in the morning when they get up for work. It was a crafty maneuver that allowed them to skirt around the question of whether or not they watched the show on Saturday night when it was aired. Concerns about an ulterior motive behind the CNN reporters’ choice of wardrobe grew after James Comey sent a certain letter to Congress just thirty minutes ago. Jester was unable at this time to access the letter, but Comey’s best friend’s aunt’s dog, a friendly Doberman named Pete, told us that the FBI will be investigating potentially relevant emails found on an unidentified cell phone in the dumpster behind Anthony Weiner’s house. This is Pete. He loves nature and is concerned about CNN’s Election Coverage.